Known large-volume Holocene explosive eruptions with a Volcanic Explosivity Index (VEI) of 4 or larger. "P" and "C" VEI codes refer to plinian or caldera-forming eruptions, respectively, of large, but unknown magnitudes. See notes below the table for additional information. The reported size, or "bigness," of historical eruptions depends very much on both the experience and vantage point of the observer. 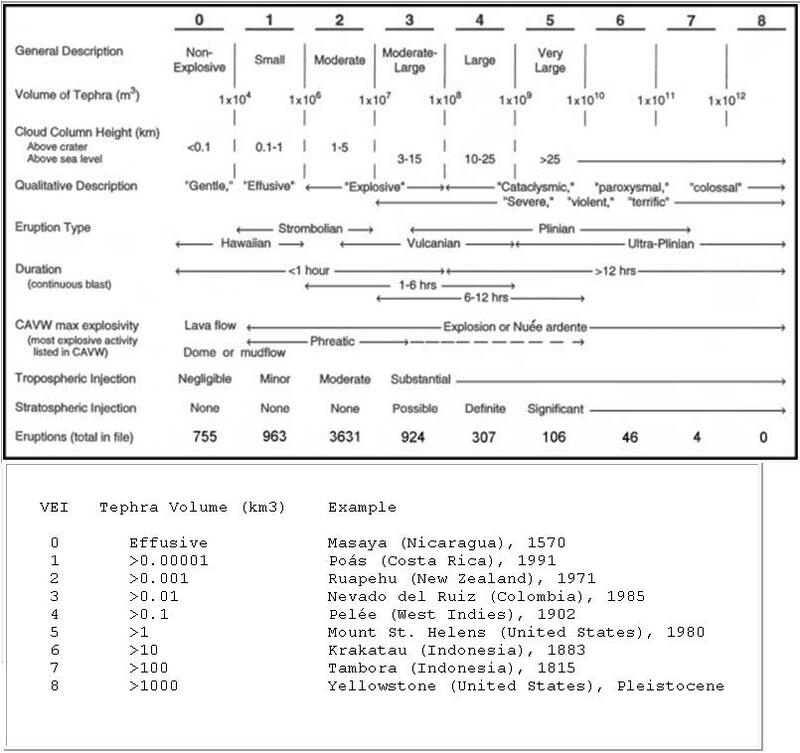 To meet the need for a meaningful magnitude measure that can be easily applied to eruption sizes, Newhall and Self (1982) integrated quantitative data with the subjective descriptions of observers, resulting in the Volcanic Explosivity Index (VEI). It is a simple 0-to-8 index of increasing explosivity, with each successive integer representing about an order of magnitude increase. Criteria for VEI assignments are shown in the table below, which is followed by examples of eruptions in different VEI size classes. VEI assignments have been updated from those in Newhall and Self (1982) and Simkin and Siebert (1994). Accurate measurement of eruptive volumes requires careful field work and is often subject to unresolvable uncertainties. Consequently, volume information is available for only a small proportion of eruptions. Volume data is displayed in two different formats. Because of space constraints in the Eruptive History table view, only the order of magnitude (in cubic meters) of calculated lava and/or tephra volumes is displayed. An entry of 8/9 under the L/T header, for example, indicates an eruption with 108 m3 of lava and 109 m3 of tephra. Because only the exponent is displayed, this means that the eruption volume may be nearly 10 times larger than shown. The Eruptive History expanded view, in contrast, has room to display the full volume data, including in some cases uncertainty ranges. It is important to note that tephra and lava volumes are listed without correction for vesicularity (the void space occupied by air bubbles, or vesicles), the extraneous fragments of older rock included accidentally in the deposit, or compaction of ash layers with time. The tephra volumes displayed, therefore, are bulk tephra volumes, and not Dense Rock Equivalents (DRE), or volumes of new magma erupted. The volcano and eruption data of this digital version of Volcanoes of the World (Siebert and Simkin, 2002-) are updated from its hardcopy predecessor (Simkin and Siebert, 1994) and originate from more than 3500 references. These references are accessible in this website through both regional and volcano-specific listings. The basic building block of the Smithsonian's volcano database is the Catalog of Active Volcanoes of the World (CAVW), a series of regional volcano catalogs published by IAVCEI beginning in 1951. In order to more easily locate these important compilations (which contain many primary references not listed in our compilation), these IAVCEI regional catalog references are bolded in our regional and volcano-specific listings. Activity Reports section of this website (Venzke et al., 2002-). The data sources referenced focus almost exclusively on Holocene volcanism and emphasize papers on volcanic stratigraphy and physical volcanology. Abstracts are typically not referenced unless they contain significant data not in other sources. As with the Georef bibliographic database, diacritical marks are not used. CAVW Editors (1951-1975). Catalog of Active Volcanoes of the World. Rome: International Association of Volcanology and Chemistry of the Earth's Interior, 22 volumes. Fiske R S, Simkin T, Nielsen E A (eds) (1987). The Volcano Letter. Washington, DC: Smithsonian Inst Press, 1536 p (Reprinting of 1926-1955 issues of the U S Geological Survey's Hawaiian Volcano Observatory). Gushchenko I I (1979). Eruptions of Volcanoes of the World: A Catalog. Moscow: Nauka Pub, Acad Sci USSR Far Eastern Sci Center, 474 p (in Russian). Hantke G (1939-62). Ubersicht uber die Vulkanische Tatigkeit. Eruption summaries published in the Zeitschrift Deutsche Geologie Gesellschafft in 1939 and the Bulletin of Volcanology in 1951, 1953, 1955, 1959, and 1962. IAVCEI (1973-80). Post-Miocene Volcanoes of the World. IAVCEI data sheets, Rome: Internatl Assoc Volc Chem Earth's Interior. Latter J H (1975). The history and geography of active and dormant volcanoes. A worldwide catalogue and index of active and potentially active volcanoes, with an outline of their eruptions. Unpublished manuscript. McClelland L, Simkin T, Summers M, Nielsen E, and Stein T C (eds.) (1989). Global Volcanism 1975-1985. Prentice-Hall and American Geophysical Union, 653 p.
Newhall C G, and Dzurisin D (1988). Historical unrest at large calderas of the world. U S Geol Surv Bull, 1855: 1108 p, 2 vol. Newhall C G, and Self S (1982). The volcanic explosivity index (VEI): an estimate of explosive magnitude for historical volcanism. J Geophys Res (Oceans & Atmospheres), 87: 1231-38. Siebert L, and Simkin T (2002-). Volcanoes of the World: an Illustrated Catalog of Holocene Volcanoes and their Eruptions. Smithsonian Institution. Global Volcanism Program Digital Information Series, GVP-3, (http://www.volcano.si.edu/world/). Simkin T, and Siebert L (1994). Volcanoes of the World, 2nd edition. Geoscience Press in association with the Smithsonian Institution Global Volcanism Program, Tucson AZ, 368 p.
Smith W H F, and Sandwell D T (1997). Global seafloor topography from satellite altimetry and ship depth soundings. Science, 277: 1957-1962. U S Geological Survey (2002). GTOPO30. Land Processes Distributed Active Archive Center (LP DAAC), U S Geol Surv EROS Data Center http://edcdaac.usgs.gov. Venzke E, Wunderman R W, McClelland L, Simkin, T, Luhr, J F, Siebert L, and Mayberry G (eds.) (2002-). Global Volcanism, 1968 to the Present. Smithsonian Institution, Global Volcanism Program Digital Information Series, GVP-4 (http://www.volcano.si.edu/reports/). Volcanological Society of Japan (1960-96). Bulletin of Volcanic Eruptions, no 1-33 [Annual reports issued 1 to 3 years after event year, published since 1986 in the Bulletin of Volcanology]. Copyright © 1994 - 2016 Photius Coutsoukis and Information Technology Associates (All rights reserved).